This is the application timeline of the Fulbright Fellowship. Interested in applying for the Fulbright program? Wanting to become part of a big and prestigious family, but feel afraid about not being selected in such a rigorous program, do not worry! we all, at some point of our lives, feel afraid about applying to competitive programs like this one since there are many people, who want to be part of it, but small spots available to be chosen. Taking big decisions in life, like going abroad for a whole year, are scary and at the same time exciting because they imply “change” or getting out of your comfort zone. Feeling scared about the outcomes (being chosen or not) and excited about the potential possibilities of change ( being selected) are feelings that describe myself back in the summer of 2011 before applying to what it turned to be one of the most amazing experiences of my life, the Fulbright experience. During that summer, the Fulbright possibility looked amazing to me; nonetheless, I have to be sincere with you guys, it looked almost impossible since there was only one spot available to the category I was planning to apply, and for sure, there were several competitive candidates applying for it, too. After several weeks of researching and reading about the program, I finally decided- last minute- to give it a shot and I applied. The application was really long and detailed. It took me hours of work to get through it by myself; however, the time I put into it was completely worthy. The time to complete the application was not as stressful as waiting to hear back from them with the resolution. As you know, the selection process takes several months (around 9 months). At that time, the site was not comprehensive and detailed as it is now. 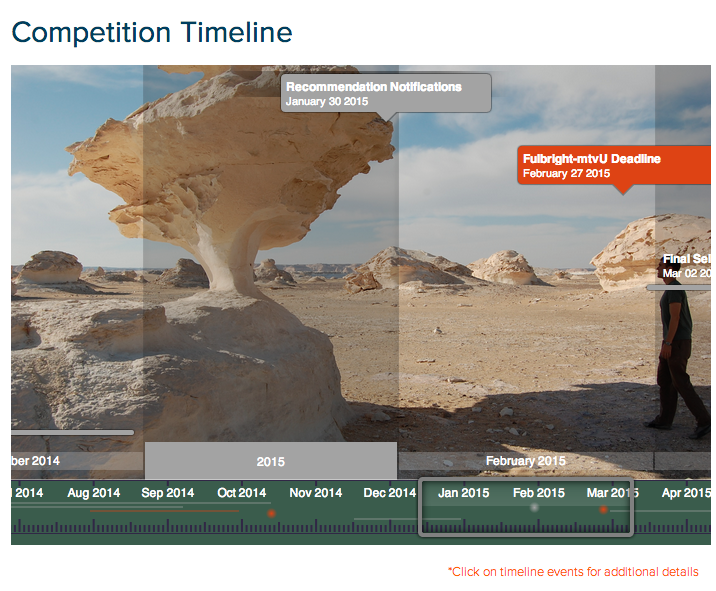 The Fulbright program, sponsored by the U.S. Department of State and Foreign Governments, recently changed the site and it now shows applicants a detailed competition timeline ( picture above) that tells applicants when to hear from them with a resolution. Even the waiting time was killer to me, I totally recommend each student to apply to it and dream about it, it totally worths your time! Now, every time I have a minute to look back and reflect about what I have achieved and experienced in my life, I feel grateful about each challenge I set for myself- including applying to Fulbright-and the great experiences that those “dreams” and “experiences” left in my life. Bottom line, do not feel afraid about taking this step, just do it! If you have decided to move forward and apply to it, follow my blog and my social networks. I am always open to hear your questions. I will be happy to answer any doubt and help you to get through the application process. I am so sure you will not regret the effort and time you put on it.